Prepare yourself. 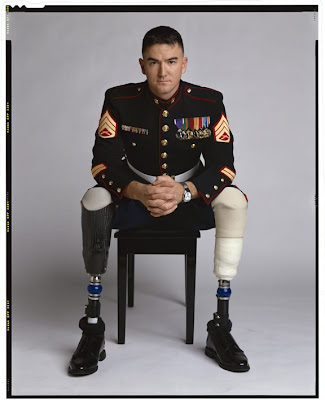 The Soviets, who spent 9 years in Afghanistan (and lost) have admitted over 450,000 wounded soldiers. Nearly 15,000 died. 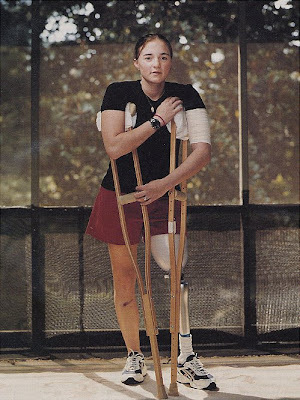 Many of the wounded were amputees, as the mountainous region with narrow trails lends itself to land mines. It was likely the financial cost of the war which broke up the Soviet Union, not Reagan's hollow pronouncements (as talk radio entertainers of a particular bent love to say) I vaguely remember news stories about the Soviets paying their troops with IOU's. Sigh. No doubt. The cost of Afghanistan, not to mention Iraq, is doing the same to us. It's a sinkhole to our resources, both financially and of our young. I posted a piece some time back about theories of what the U.S. might look like after a similar breakup. Most Americans are too arrogant or too proud to believe it could happen— but it could. And for anyone reading who may think I am not patriotic, that's not the case. Today, as I do every day, support the individual soldiers who walk those narrow dusty trails—who do their job without complaint. And for those who died. As the proud son of a man who landed at Normandy Beach and took a grenade in his stomach a few weeks later in the Battle of the Bulge (thus saving his life) I agree with you 100 percent. I'm sorry to bring political notions to an artistic place. I do not envy any artist engaged in the delicate balancing act of creating political art without appearing strident. It is tough...but I've been pondering the same issues since Vietnam. Tis time to learn.